New 4-Legged Recruits Join Fairfax County Police Dept. 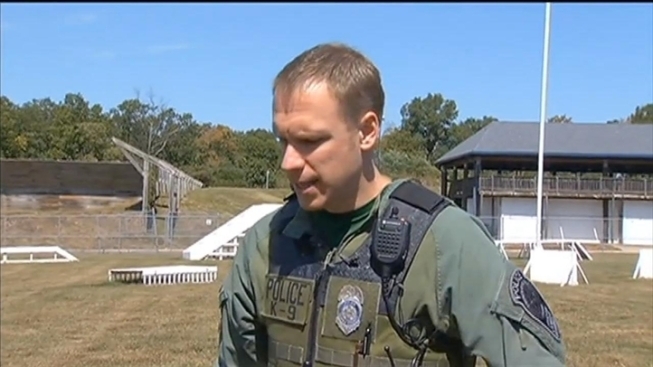 The role of man's best friend is doubling at a large Northern Virginia police department. A pair of bloodhound puppies are in training to become the newest recruits to Fairfax County Police Department's K-9 unit. The 13-month-old purebreds, named Bolt and Silas, joined the K-9 unit last month and will be in training for the next 10 months. They're paired with officers Pete Masood and Kevin Clarke. As a part of their training, the pups live with the officers and their families. "Everything to them is new, every noise, even the airplanes," Clarke said. Bolt and Silas' value jumps from roughly $600 to nearly $15,000 once they're street-ready. The pups join two adult, fully-trained bloodhounds, doubling the department's K-9 unit and making it easier for Fairfax County to assist other jurisdictions in their investigations. A case in point is Monday's Navy Yard shooting. In the midst of the active shooter response, the Metropolitan Police Department called on Fairfax County Police for help. They sent in an adult bloodhound and her handler to trace scents. "I believe that was in case they had an extra suspect outstanding," Clarke said. Even in the midst of chaos -- like Monday's shooting -- the dogs can stay focused. "He would be able to work through that odor, even though there's literally thousands of people being evacuated," Clarke added. In News4 Northern Virginia Bureau's recent digging of search warrants, it became evident that one of the police bloodhounds found the body of Emylee Lonczak. The teen went missing in late August, and the next day, the K-9 connected with her scent between two Vienna-area homes. "They play such an integral role in a lot of major cases," Clarke said. "These dogs are used in homicide cases, missing children, missing adults, alzheimer patients, that sort of thing."